Buyer, Seller, Landlord, Tenant? You can maximise your chance of success by retaining a real estate professional to fight your corner: a commercial real estate broker with an impeccable reputation, forty year track record, deep pool of contacts founded on trusted relationships, expertise based on a seven year structured training program, access to market data and CompuVal® leading edge information technology… a commercial real estate firm whose objectives are perfectly aligned with your own, someone you would trust with your first born. Building on long term relationships dating back over four decades in Atlantic Canada our real estate Brokerage Team provides sale, purchase, lease and rental services for commercial properties located in Nova Scotia, New Brunswick and Prince Edward Island. Our principal focus is commercial real estate located within a 100 kilometre radius of the Halifax Regional Municipality (HRM). Our Brokerage Team has marketing expertise in most types of real estate: investment, industrial, office, retail, multi-family (apartments), hotel or motel, acting for owners wishing to lease, sell or purchase as well as tenants seeking rental space. Training – hired direct from university they are the product of our unique seven year training program which blends mentored commercial real estate work experience, the University of British Columbia’s Diploma in Urban Land Economics (DULE) and Bachelor of Business in Real Estate (BBRE) degree, negotiation courses through Dalhousie and Saint Mary’s Universities, and twenty seven “in house” Training Modules. Compensation – salaried rather than commission based, they can focus on our clients’ long term interests rather than “the deal”. Data Driven - CompuVal®, our proprietary leading edge IT platform daily acquires, integrates and analyses sales, assessment, rental, revenue and operating expenses from multiple sources; tracks tenants, purchasers, sellers and landlords… and real estate available from other commercial real estate brokers and the Multiple Listing Services®. Specialist Skills – our six consulting Divisions, Valuation & Appraisal, Property Tax, Counselling, Lasercad® Space Measurement, Economic Intelligence (Market Surveys, Site Selection, Trade Area Analysis, Supply & Demand Analysis) and Planning give our Brokerage Team access to a range of skills and a much broader perspective than can be achieved acting alone. Quality Control – we are the only commercial broker in Atlantic Canada governed by a quality system registered to the international ISO 9001 standard. Local Presence – nobody knows Atlantic Canada’s property markets better! Every day our real estate teams fan out across Eastern Canada from our head office in Halifax and satellite locations in Charlottetown, St. John’s, Saint John and Toronto, meeting with property owners, buyers, sellers, landlords and tenants, gathering real estate intelligence and assisting real estate clients with the operation, acquisition, disposition, leasing or renting of their office, industrial, retail, hospitality or other property. In many commercial real estate transactions, each party is represented by a broker… sometimes the same brokerage, albeit with different sales/leasing agents. To avoid possible conflicts of interest we will not represent both parties to the transaction. We have also created a commission structure which is “broker neutral”… our commission will not increase if another broker is not involved. We can thus focus on the transaction, encouraging other broker participation when it is beneficial to consummate the deal. We believe that our clients should know what our services will cost before we commence the assignment… there should be no surprises! Our vendor/purchaser and landlord/tenant representation agreements clearly specify the scope and the cost of our work. We are happy to provide Fee Quotations. 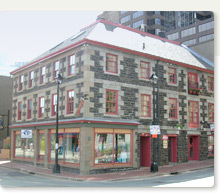 Vendor Representation affords sellers of investment, industrial, office, retail, multi-family (apartment), hospitality (hotels & motels), land and special purpose property, a sophisticated marketing program with local, regional and global reach for properties located in Nova Scotia, New Brunswick and Prince Edward Island. Its primary focus is centred on a 100 kilometre radius of the Halifax Regional Municipality (HRM). We also represent purchasers through our Purchaser Representation program. Landlord Representation provides owners of industrial, office and retail property with a structured marketing and leasing program for space located within a 100 kilometre radius of the Halifax Regional Municipality (HRM). We can also represent tenants through our Tenant Representation program. Our Brokerage Products Video illustrates our four Brokerage products whilst Brokerage Case Studies detail a sample of the brokerage successes we have had for sellers, buyers, landlords and tenants.